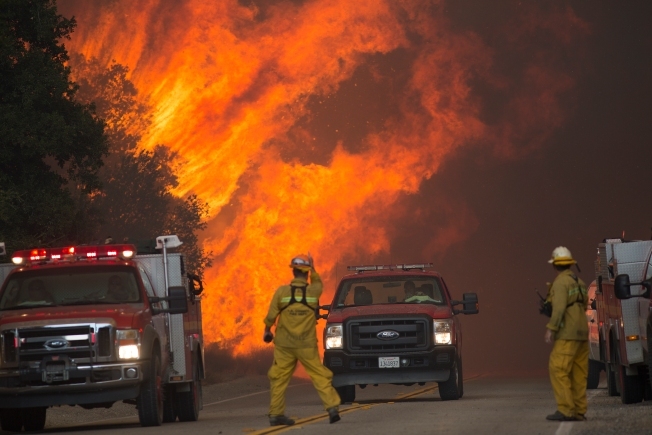 Firefighters are forced to retreat as flame close in on them in Placerita Canyon at the Sand Fire on July 24, 2016 in Santa Clarita, California. Some 200 firefighters and supporters of the California Department of Forestry and Fire Protection on Monday rallied for higher wages on the steps of the state capitol. Members of Cal Fire Local 2881, the union that represents 6,000 state employed firefighters who respond to brush fires and major emergencies up and down the state and calls for service in 36 of the state's 58 counties via contracts with local governments, marched blocks from their offices to the state Capitol. It was the first such rally the agency has had since the 1970s, said union president Mike Lopez. Firefighters say they are paid less and must work more hours compared with their counterparts at other agencies. They say that when they leave Cal Fire after 15 years of service at the rank of fire captain, they go to work for a local agency and make more money, work fewer hours and earn better benefits as a rookie firefighter. "It went well," Lopez said. "We going to keep trying to push to get them to come back to the table and negotiate." Firefighters in the 20 largest agencies in the state with more than 75 personnel, for instance, can earn up to $8,700 a month in gross base pay before retirement and benefits are taken out, compared with a Cal Fire captain who earns up to $4,609 a month in gross base pay, said Tim Edwards, the state rank-and-file director and chair of the union's negotiating team. Like other municipal fire agencies, Cal Fire firefighters also earn overtime. All municipal agencies in the state have 56-hour work weeks, while Cal Fire firefighters work a 72-hour workweek, Edwards said. Cal Fire firefighters last received a pay increase of 4 percent in fiscal 2014-15. The current agreement is scheduled to expire in July 2017, officials said. Brian Ferguson, a spokesman for the California Department of Human Resources, the agency negotiating with the union, said last week that "the state must balance the needs of many different bargaining units and the overall state budget." Harley Shaiken, a labor studies professor at the University of California, Berkeley, said that the union's push is a "very real, but hidden cost of climate change." "There are people on the front lines of this where this is their livelihood," he said. "They're feeling increased pressures and all the tensions that are related to this. At a minimum this is putting it front and center. These are real fiscal issues. There are a lot of other urgent priorities, but this has to be put in that mix." The push comes as firefighters are putting out or mopping eight fires currently burning across the state during California's sixth year of historic drought and extreme heat combining to make for tinderbox conditions year round.